It is one of the important and most studied branches of science that combines biology with chemistry. Biology is the subject that delas with real facts and information’s related to living portion of the world whereas chemistry deals with chemical changes and processes that takes place in the body or a system. Therefore, when these two fields are combined, it gives biochemistry that becomes an important subject for biology as well as chemistry students. It explains all the complex biological processes that occur in living system thus understanding life and its progress on the earth. Biochemistry is related to many more fields of science. Genetics, cell biology, molecular biology all have a close link with this subject. Biochemistry deals with structures, functions and processes of many important molecules of life such as carbohydrates, protein, lipid, amino acids, etc. Knowledge of biochemistry is extensively applied in different fields like that of agriculture, medicine, research and nutrition. They are the source of energy. They help in building up structure of cell. They are also the structural material for many other organisms. They help in growth of the cell. Classification of carbohydrate: carbohydrate can be classified into different types as per their importance and structure. They are monosaccharides, oligosaccharides and polysaccharides. 1. Monosaccharides: these are the simplest group of carbohydrates having formula Cn(H2O)n. Monosaccharides cannot be further reduced in any other form. These are also sub- classified as per the presence of carbon and the functional group. Aldose: in this case, if the functional group is aldehyde they are called aldose. Such as : glyceraldehydes. Ketose: here, functional group is ketone. E.g. Fructose. Trioses: in this case only three carbons are present. Tetroses: in this case four carbons are present. Pentoses: in this case five carbons are present. Hexoses: in this case six carbons are present. Heptoses: in this case seven carbons are present. 2. Oligosaccharides: In these types of carbohydrates, more than 1 monosaccharide molecule is present. It can be from 2- 10 , thus named as disaccharides trisaccharides, trisaccharides and so on. These can be hydrolyzed into simple form to get the monosaccharide’s molecules. Among many oligosaccharides, disaccharides are the most common. They are sweet in taste and are strongly held by glycosidic bond. Disaccharides are of two types: reducing and non- reducing. Reducing disaccharides have free aldehyde or ketone group such as: maltose and lactose whereas non- reducing disaccharides do not have free groups. Example: sucrose, the most common non- reducing disaccharides. Homopolysaccharides: when they are hydrolyzed, they give same molecules of monosaccharide. Example includes: starch, insulin, dextrin, glycogen chitin and cellulose. Heteropolyssacharides: when they are hydrolyzed, they give different molecules of monosaccharide. Such as mucopolysaccharide. It acts as the reserve fuel for the body. Help in the process of digestion. Maintains the communication of one cell with the neighboring cells. Lipid: these are small molecules that are heterogeneous in nature and are involved in structural development of cell along with energy storage. These can be further classified as simple, complex and derived lipids. 1. Simple lipid: these are simple in composition consisting of fatty acid and alcohol. Such as waxes, fats and oils. 2. Complex lipid: these are similar in composition to simple lipid but here an additional group is also present that can be either proteins, nitrogenous base, carbohydrates and many more. Example includes phospholipids and glycolipids. 3. Derived lipids: the lipids obtained from the combination of other hydrolyzed lipids are called derived lipids. It helps in protection of internal body organs. Provides structure to the cell. Help to regulate the permeability on a membrane. They are the sources of many vitamins. Reserve fuel of the body. 1. Primary structure: it is the simple structure that is linear in form and makes up the backbone of proteins. 2. Secondary structure: it is quite a complex structure that is formed form twisting of primary structure and thus forming a spatial arrangement. 3. Tertiary structure: it is the complex of all above thus forming three dimensional structures. 4. Quaternary structure: these are formed of different polypeptide linked together to form a spatial arrangement. Proteins can also be classified as per their function and nature. Structural proteins, catalytic proteins, transport protein, hormonal protein, contractile protein and storage protein are the division of protein on the basis of their structure whereas simple protein, conjugated protein and derived protein are the classification as per their chemical nature. Proteins play an important role in the body and thus carry on the various process of the living organism. Nucleic acid: these are the molecules that are responsible for genetic makeup of any organism. Along with C, H, N and O, nucleic acid also has phosphorus, the most important of all is the DNA and the RNA. The DNA and RNA have nitrogen bases held by hydrogen bond; adenine, guanine, cytosine and thymine are present in DNA whereas in RNA thymine is replaced by uracil. They are divided into two different groups, purines and pyrimidines. Adenine and guanine comes under purines whereas rest comes under pyrimidine. Therefore, nucleic acid helps in genetic makeup of an individual. Though we see lots of differences between organisms or individuals, but when genetically studied it can be easily found out that they are completely connected and similar to each other in the molecular or the basic level. It is only the evolutionary changes that have created differences in these organisms. Therefore, genetic makeup of the organism plays an important role and hence these genetic makeups are based on the biochemical process and the arrangement of bimolecules to give an effective result. Biochemistry is a single subject and a complete field, but the knowledge and ideas of biochemistry is used in many more areas of science. Molecular biology, genetics, even the field of evolution use information of biochemistry to find out facts and figures of the past events. Biochemistry is not only about living beings and the processes that occur within their body but it also looks upon the changes in chemical matters that are present in the universe. 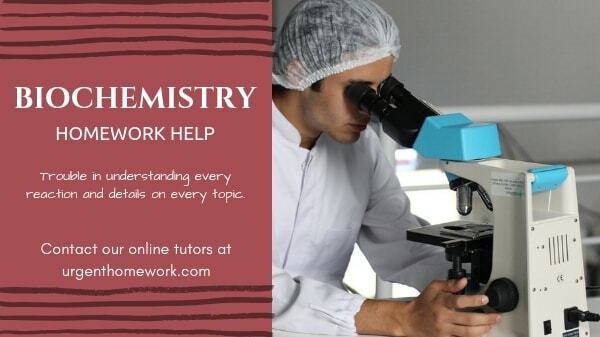 Biochemistry talks about all the molecule, whether micro or macro that are involved in progress and development of body, therefore this subject will not only help in research filed, but also medical students, honors students, researchers, lecturers, or anyone who pursue science must at least possess the basic knowledge of this subject. This can help them add up much more details slowly on every topic and understand things in clear and simple way. Biochemistry is one of the important subject is any field of science but it becomes quite a tiring and complex for the students to understand every reaction and details on every topic. Hence, only the patience and hard work can help them reach their goal along with appropriate guidance.